Mix the melon, mangos, apple and peaches. Mix the yogurt, condensed milk, milk and vanilla in a glass bowl. Refrigerate. Crush the Nature Valley™ bars in a food processor until ground. Serve the fruits in 4 dishes, pour on the cream and add the Nature Valley™ granola. You can use other season fruits like bananas, nectarines, cantaloupe, etc. Prepare the cream in advance and keep refrigerated. You can use shredded coconut and nuts to give it a different flavor. Silvia Martínez School is about to start and I'm already making my list of ideas for lunches and snacks for children. I know my kids are hungry when they get home after a full day of activities in the classroom. A few days ago when I was making my list, I remembered the fruit energy snacks (or bionic as they are also known in some areas of Mexico). I remember when I was in high school I loved to eat it and I thought it was a great snack for kids. 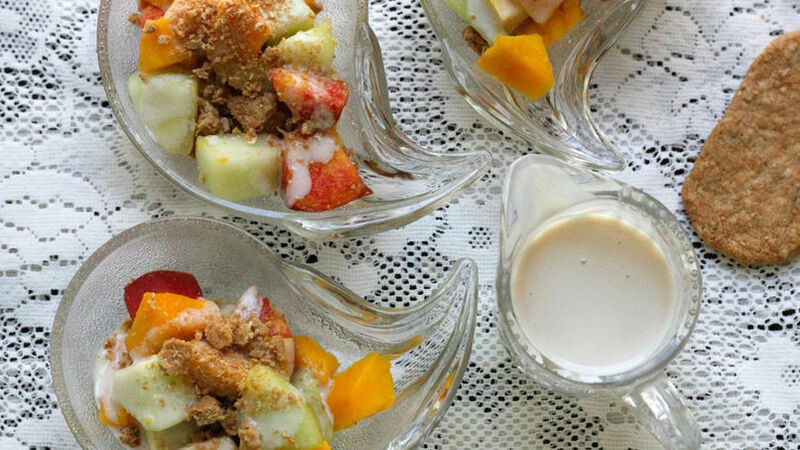 The energy snack is basically made of seasonal fruits covered with delicious sweet cream and granola. To make it lighter I used plain yogurt instead of heavy cream, and the result is delicious. Hope you like it.